Hambantota port development project halted? The Hambantota Port Development, a China Merchants Port Holdings (CMPort) project on the southeast coast of Sri Lanka, has stalled at the Framework Agreement stage, reports Sri Lankan News First. According to the report, the Chinese Ambassador Yi Xianliang said “No progress” when questioned yesterday, October 1, on the completion dates of the project. The framework agreement for this project to be operated as a public private partnership between the Sri Lanka Ports Authority and CMPort was signed on 27 July 2017, following over a year of discussions between the parties. But several sub-agreements need to be endorsed for the work to proceed, according to the Chinese Ambassador. He also said that even after all relevant agreements were signed, a port without the proposed Industrial Zone adjoining it being established would be of no use. He has admitted, although, that there are certain legal matters that need to be concluded as well as some tasks to be completed by the Public Enterprise Development Ministry, the Ports Authority and the Finance Ministry to provide tax concessions. However, may be the reasons for the holdback are deeper? The analysts claim the local cargo base is quite low and the transhipment volumes being the main aim of the project are severely compromised by the Indian rather cool attitude towards Chinese One Belt One Road programme, partially because of its significance for the rival Pakistan. Therefore, India has not been supportive of the Hambantota Port project and even voiced concerns regarding the dominant role of China and the port’s potential use as a military base. Still, the Framework Agreement was signed, Sri Lanka accepted loans for the port development but will be struggling with their repayment. The deal structure of the Hambantota Port project looks as follows: CMPort – 69.55%, the Sri Lanka Ports Authority – 30.45%. 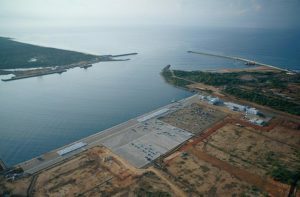 Under the agreement, two limited liability companies are to be established under the Companies Act in Sri Lanka as joint ventures: Hambantota International Port Services company for common user facility operations, where the Ports Authority will have 50.7% of the shares, and Hambantota International Port Group company for terminal operations, where CMPort will have 85%. According to the agreement, CMPort is to secure a 99-year lease on the port and about 15,000 acres nearby for an industrial zone. The Sri Lanka Ports Authority will be given the option to repurchase all shares after 70 years.